Throughout his ministry, Jesus traveled about from place to place “proclaiming the gospel” (which means “good news”). For Jesus, the proclamation of the gospel always had two vital aspects: word and deed. The gospel isn’t only about our individual spiritual experience. It’s also about restoring shalom (the Hebrew word for peace, harmony, wholeness, completeness, prosperity, welfare and tranquility) to God’s world. In rural Ohio, a major barrier to shalom is food insecurity. There are far too many of our neighbors going to bed hungry. To combat this growing problem, Hanover Presbyterian is continuing to increase our involvement with local food pantries. 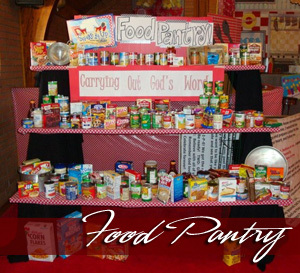 On the first Sunday of every month, we take up a red-wagon food collection for the Pleasantview Food Pantry. Our young people bring a red-wagon, laden with gifts for the pantry, up to the communion table where we symbolically sit at the Lord’s Supper together with those we will help. On Souper (Super) Bowl Sunday and throughout the year, food items and financial contributions are given to the Food Pantry Network of Licking County.